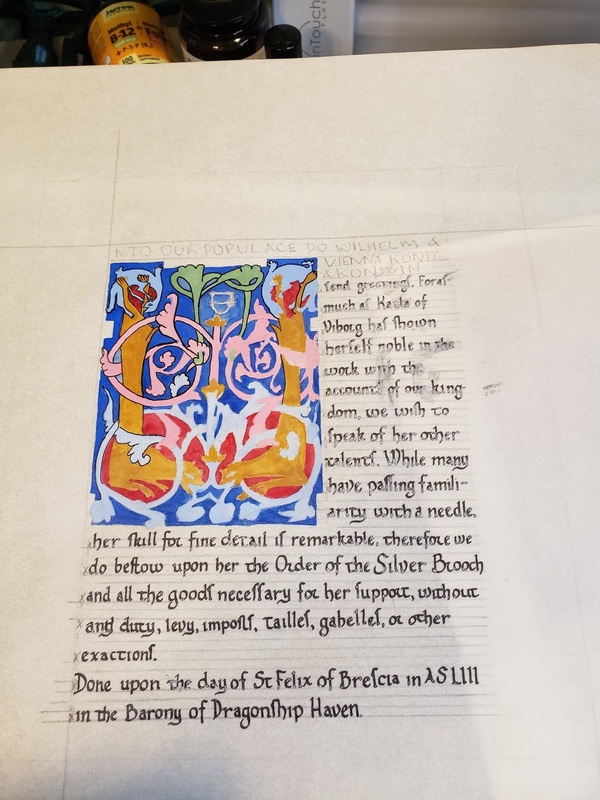 A sister scroll to the last gothic one..
Oh Luttrell Psalter, you are so sneaky, with your pretty pretty pictures and your nice clean calligraphy – you make it all look so easy… like anyone could do that… But no, don’t be fooled, this manuscript lies to new scribes. It whispers “oh don’t worry, it’ll be fine, look at my nice crisp lines and my pretty little s’s, this won’t be hard” when really it’s a deceptively difficult manuscript to copy. Talking to various other scribes, this is a common trap that new scribes fall into, particularly ones who are more comfortable in illumination since it has such pretty pictures, but it is possible to do, particularly once you accept that yours is not going to look quite as perfect as the original. This is the second scroll I’ve done from this manuscript in the last few weeks, and I figured the first one’s calligraphy was hard because I just hadn’t had enough time to properly learn it, so I figured the second one would go better since I had already put in so much practice time on the first. The second one did go better, but I think I need a few more years worth of practice before I can do this hand justice. I chose this particular page as the person the scroll was for is a thirteenth century harper, and King David and his harp leaped to mind, plus I love this page. Now look back at the previous post, that’s supposed to be the same hand – so yes, I’m making definite progress, but man is this hand hard… I’m going to set this manuscript aside for a little while and go back to my good friends in the proto-gothic world where I can actually feel a little bit of confidence.. But! My spacing and vertical lines look much better. They still need work, but way better than last time. I mostly traced this one (the vines and leaves are all free hand, along with the diapering and whitework), but I’m doing a second that is entirely free hand since the images are really easy to free hand and then I can work them into the design I want more easily. I chose to trace in this particular case because I had procrastinated too long and needed to get the shapes on quickly so I’d have time to do all the layers I wanted to do. Part of the reason I was rushed with this one was that it’s my first with metal leaf, and that took quite a bit longer than I had expected. I used Mona Lisa’s Silver Leaf from their gilding kit, which I highly DO NOT recommend. Firstly the directions are terrible, and secondly, the ‘silver’ is tin, which is fine, except that it doesn’t cut nicely so it’s really hard to brush away the extra that’s not supposed to be there as when you brush it, it rips across the part you do want. I now have plenty of the much better quality stuff to try, but I thought it might be a good idea to start with the cheaper option to see how it went, and as usual, it was miserable. It’s not terrible. Ok, it’s pretty terrible, but given how much Gothic and I do not get along, it’s pretty good. The three things I struggle with the most in scribal are 1) word spacing, 2) Verticals being vertical, 3) Getting my feets correctly on the baseline. (Yes, I’m sure there are lots of other things wrong as well, but these are the ones I’m most working on right now). So the big difference with this scroll was that I used Vertical guidelines for the first time, and it’s something. 1) Word Spacing. Within the word, and between words, it’s still not great, but this is probably the best I’ve done so far in terms of my words all being appropriate distances from each other, and the internal spacing in words is pretty decent. I think the vertical guidelines helped the most with this aspect, mostly as they created a grid that I could use to see how far the letters were from each other, and I could count on them to be regular. 2) Verticals being Vertical. 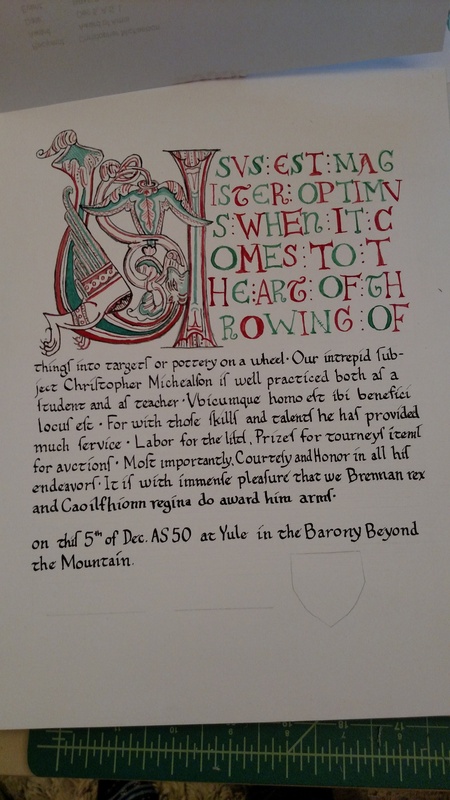 This was the reason I used vertical guidelines for the first time with this scroll, and I suspect they helped, but I’m kinda amazingly oblivious to the guide lines, it’s like my hand just desperately wants to slant all my letters every which way and is revolting against the guidelines. They aren’t terrible, but being gothic it’s really obvious when they are slightly wrong. I really need to practice this ALL THE TIME. 3) Feets. Thankfully this hand has mostly flat feets, I’m especially terrible at getting pointy feets to end up in the right place.. but even with flat feets it’s really hard to remember what I am doing – mostly from a serif perspective, I really love adding little serifs, and this hand has very few serifs. But these feets were also supposed to be square, and that was very hard to do without having practiced enough. I suspect my feets would have been considerably better if I had given myself enough time to actually properly learn the hand and not been rushed. I kinda want to animate my letters as they have definite personalities.. my Ys are so often drunkenly sliding under the table, while my V’s have too much confidence and my As are desperately trying to hold everything together but failing since their mates dislike them for thinking they are perfect. You can also definitely see me getting more tired and sliding back into prot0-gothic, but it looks okay. ish.